Everytime the archbishop of Toronto appears on these pages, people from all over respond in a uniquely enthusiastic way, and in notable numbers. Why, you ask? Because, in the finest sense of the term, Thomas Collins "gets it." And whether the 60 year-old prelate's talking up cats, the priesthood, his boyhood hero Fulton Sheen, or preaching amidst the lilies of the field -- the YouTube debut that scored him over 4,000 views -- Benedict XVI's most-prominent appointee to date in the Anglophone world echoes the teacher-Pope's knack for engaging the faithful with the same mix of gentleness, sincerity and substance that've won the pontiff a captive global audience. But seven months into his stint as pastor of Canada's largest diocese and its 1.7 million Catholics, the approach is what Collins promised it'd be on his arrival: a ministry not just to the "gathered," but the "scattered," too. And though the archbishop says he's still learning the lay of the land, the fruits are already popping up; a reader wrote in over the summer that a friend of his "who left the church decades ago... now attends Sunday Mass at St Mike's [Cathedral] hoping that TC will be preaching." "There is a pastoral way about this man that is remarkable," the reader wrote. ...well, aside from the coffee-and-donut-fueled chats over a table at Tim Horton's. 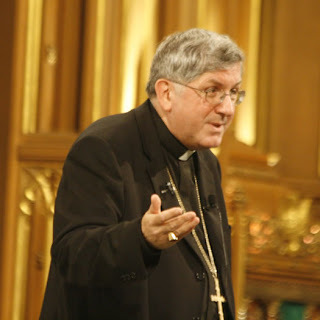 As archbishop of Edmonton, Collins -- at the prompting of some of his Alberta flock -- began a monthly series of Lectio Divina services in St Joseph's Cathedral there. In a short amount of time, the Sunday night gatherings for formal Vespers, followed by meditation and reflection on a short Scripture passage, became a hit. And, it could be said, the return of the ancient practice in the Canadian West was ahead of the curve; in 2005, the Pope himself said that "if it is effectively promoted," Lectio Divina "will bring to the church – I am convinced of it – a new spiritual springtime." On Sunday night, the first of the Toronto sessions took place in St Michael's, with the Sermon on the Mount as its text. With the "scattered" in mind, the Lectio series will be podcast in full; the first evening comes in two parts (links open as mp3): Collins explaining the practice, and his meditation/reflection in its entirety. Tolle, exaude... Take and listen.